Full of authentic local flavor, MEN ON THE DRAGON (YIK LAU DAI SHOOK) was a critical and commercial hit. Earlier the film even brought director Sunny Chan Wing Sun and star Tony Wu Tsz Tung to London for the Hong Kong Economic and Trade Office sponsored Chinese Visual Art Festival and the film's London premiere. Wu Tsz Tung deeply felt the audience's passion and anticipation for Hong Kong film. While at work he also remembered to get gifts for his girlfriend Stephanie Au Hoi Shun. However Wu Tsz Tung said that he had some regret from this trip to London, which made he state that he would return to England to fulfill his dream. Wu Tsz Tung earlier with WEEDS ON FIRE (DIM NG BO) attended the Toronto Film Festival, but this time he was able to go to London for the first time for an art festival with MEN ON THE DRAGON. He was rather excited and anxious. He explained, "Earlier the director and Jennifer (Yu Heung Yi) went to a New York film festival, the audience reaction was great." After the screening, the audience kept asking the director and Wu Tsz Tung questions. "An English viewer said that this type of inspirational film was very 'marketable' in England and would have a lot of room to exist. He hoped the director would bring this type of ideas to England." Both he and the directors were greatly encouraged after hearing that. 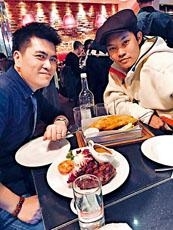 Although the schedule was rather tight, for his first visit in London Wu Tsz Tung had to take time for himself. He thanked the director and his wife for taking care of him, showing this "orphan" around. As Valentine's Day neared, Wu Tsz Tung also did not forget to shop for his girlfriend. "I bought a tea set for my girlfriend, but the temperature difference indoors and outdoors in London and I was in a rush, when I made the purchase I got a little light headed." As a soccer fan Wu Tsz Tung said that he had some regret from this trip to London. Did it have anything to do with his girlfriend not being there with him? He said, "My team Man U was competing in London, because of work I couldn't go to the match. I can only keep working hard and hopefully my next films can bring me back to England many more times."